But no sleep runs this deep..."
Though relatively unknown in the States, brooding Australian musician Nick Cave has carved out a rather stellar list of richly downbeat music over the years, from his shaggier days with The Birthday Party in the 1980s throughout the 1990s, with his sporadic solo material and his work with his "unofficial" band The Bad Seeds. Cave sports a sub-rumbling deep growl of a voice, and he continually spews forth tales of woe, misery, and lost loves like a demented revivalist tent preacher. Even when the guy puts out an upbeat song, such as his somber take on What a Wonderful World with The Pogue's Shane MacGowan, there is a decidedly cloudy cast to it. Mute Records has gathered up 20 music videos from Cave's career, spanning 1984 up through 1997, for this new collection, and while it obviously lacks some of his most recent material, it pretty much stands as an essential 'best of' for Cave fans. There's no sequential chronology to the way the videos are presented here, and in addition to a quick card with the title and year, each track is introduced by Cave and the Bad Seeds, who offer a quick comment or two about either the song itself or some component of the video production. All of his signature tunes are here (such as Red Right Hand and The Weeping Song), as well as a quirky cover or two (In the Ghetto, What a Wonderful World) and the unsettling juxtaposition of one his more lyrically graphic numbers (Stagger Lee) appearing just before one of his most sweetly innocent (Into My Arms). The effect is appropriately dizzying, and it is perfectly indicative of the moody ebb and flow of Cave's music, and it is almost more unsettling to hear him tackle a song that doesn't involve some disturbing imagery. When he surrounds himself with small children in the video for The Ship Song (from one his finest, 1990s The Good Son), singing about trying to "define our moral ground, but when I crawl into your arms, everything comes tumbling down", there is something that seems both wonderfully pure and unnaturally dangerous. The quality of the videos themselves varies, with some of the earlier selections being rather low budget affairs; these all weren't grand Duran Duran-level production values, and the early tracks were seldom seen on outlets like MTV, so personally I'm glad for the chance to get a chance to finally get to see them. Later projects, like the dark, bad dream visuals of Red Right Hand play well against the oddly comic vamping of Cave-as-boozing-reverend in The Weeping Song or the slowly simmering lust that rises up in his pairing with P.J. Harvey on Henry Lee. From a visual standpoint, the zenith on this set is probably a toss up between his duet with fellow Aussie Kylie Minogue, who plays against her sexpot image by appearing as a lovely corpse in the lush Where the Wild Roses Grow and the black-and-white lay-your-hands-on-me balladry of Into My Arms, which if my lovely wife Jeanine and I were to renew our vows, would no doubt be our wedding song. I always wonder if music video discs like this just preach to the choir, or if there are curious types who might take a chance on something new, hoping to find something hip and cool. Image Transfer Review: The image quality of these assorted videos varies, with older clips (such as Cave's Elvis cover of In the Ghetto) plagued by moments of blocky grain and smeary coloring. The newer pieces have substantially improved production values, and the presentation is sharper, richer and noticeably more appealing. On the plus side, the black-and-white cinematography of Into My Arms reveals outstanding contrast levels, but it's hit-or-miss from track to track, though the quality never dips to far to the bad side, despite some a few brief, ugly moments. Audio Transfer Review: Normally I'm not a big fan of PCM mixes, or at the very least having that be my only audio choice on a music DVD. The presentation here is a bit of surprise, offering substantially more in the way of a pronounced .LFE track than I normally encounter on a PCM mix. Instrumentation and separation is within acceptable levels, but doesn't really have the expansive richness that a well-heeled 5.1 mix can provide. Some of the interview segments (they lead into each track) sound a bit muddy, but most of the video clips deliver clean, discernible lyrics. Extras Review: No extras to speak of, though the disc is cut into 20 chapters and features optional Spanish subtitles. 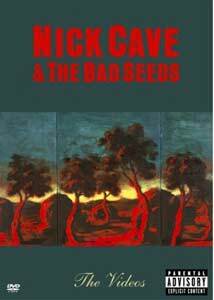 He may be an acquired taste, but Nick Cave excels in creating gloomy and brooding dirge-like music anchored by his rumbling growl of a voice. This collection of twenty music videos, spanning a small part of his career from 1984 through 1997, is grim, cool and full of Cave's patented bad boy/crazed preacher swagger.